CyberZone is our multiplayer PC gaming arena: all with identical specification so your opponents will never have an unfair advantage. Our PCs are based on Intel Core 2 Duo E8400 processors, with a high-spec gaming graphics card and a 19-inch TFT monitor, with 2ms response time. Every gaming computer has a 750GB hard drive holding a wide range of games - over 200 in total - connected to a 24Mb high-speed ADSL2+ broadband Internet line, so you will get top speeds, minimum pings and no lag in online games. 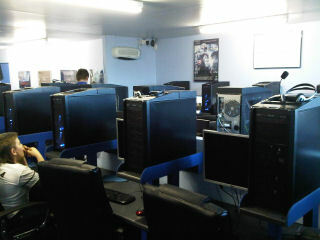 All computers are networked together so you can play against any number of other players in the building at once.